They’re popular of course with business premises and corporate services, but still good to note in other contexts, whether other community and organisation’s interests, or even domestic homes. In actual fact, it can be even more important here to get hold of the essential basics as they can otherwise be taken for granted or not even considered. Therefore here are 10 risks that most cleaning services will come across, and a great starting point to then develop your own unique risk assessment (you can download a simple cleaning risk assessment template here as well). From a proactive basis, you need to prevent slips and trips from people near a wet floor after being, say, mopped, with measures like signage and closed-off areas in addition to arranging the cleaning at times of low use. However, you also need to prepare for reactive situations like spillages and any cleaning-up-kit and procedures to help immediately ring-fence off and deal with. The whole COSHH and health and safety procedures of course need adherence to, and these can be identified in the risk assessment. It’s important for new cleaners to be suitably trained in these, with measures such as correct use and mixing of substances, appropriate use of PPE, and the right storage of items being key. Cleaning will of course involve chemicals to some degree, whether serious bleach or less risky hand-washes, but they all need to be correctly used with plans in place to deal with any hick-ups. Spillages may happen, ending up on people’s hands or even rubbed into eyes. Therefore times when these are used need to be carefully planned for, for example placing bleach substances within a bucket. The right PPE is essential, and a ready-to-roll cleaning-up kit and plan in case things do go everywhere. Cleaning substances need to be correctly stored away, not to mention other items like PPE and cleaning equipment also being in the same boat. Problems can range from theft of items to accidental taking of them, whether an adult in a rush or perhaps a child mistakenly finding their way into a cleaning cupboard. So make sure things are correctly placed on the right shelves and areas, doors locked, signs erected, and checks in place to monitor. Accidents can of course unfortunately happen at anytime, therefore it’s worth a specific mention in itself as to how to deal with these. Knowing what can’t as much as what can be done there-and-then is important, right through to the after follow-up and record of the incident. Unplanned blockages can cause issues, the most obvious one is a trip hazard, but also wider injuries if you end up for example walking into them. Two classic bulky items to watch out for are a vacuum cleaner and mop-and-bucket. Whether it’s the actual main equipment, or the vacuum hose or mop-handle that suddenly falls down, they can be a harmful barrier if you’re not expecting them to be there. So cordon off prone areas, keep the equipment in safe places, and keep ancillary items like a vacuum extension cables short and out of the way. Rubbish gets generated anyway, but particularly so with cleaning and disposing of everyone’s rubbish as well the cleaners. It needs to be out of the way of trips or people meddling with them, and any specialised items like cleaning substances, waste food, and bulky items disposed of accordingly. Mixing of things can cause a cocktail of disaster, even with appropriately safe cleaning chemicals and substances that a cleaner may not be aware of can’t be mixed together, either deliberately or mistakenly by, say, using the same uncleaned container. Everything therefore needs correct storage, with clear procedures on who is experienced and trained enough to use them. Watch out for other non-cleaning hiccups as well, particularly in more risky food-preparation areas, and even things like people mistakenly placing flowers in jars of water that are also used for drinking purposes. Any form of building and DIY works needs risk assessing, whether planned or suddenly being carried out. In addition to the literal mess and clutter, watch out for the aftermath of dust and debris which can often take hours and days to fully settle afterwards and may take a phased approach to cleaning. Separate stores will be needed for any related products and substance under COSHH obligations, for example paint and stain, and watch out for tools and PPE also getting mistakenly mixed-up with general cleaning items. A final point, but actually a very important point is ensuring the safety of each individual cleaner, who may well need to work alone in hidden areas and out of usual living or working times. Their safety, as well as those they’re in contact with is important and measures may include regular contact with others, and working at restricted time or areas. Therefore once you’ve gone through these important aspects and potential risks for your cleaning activity, you can begin going into the detail. 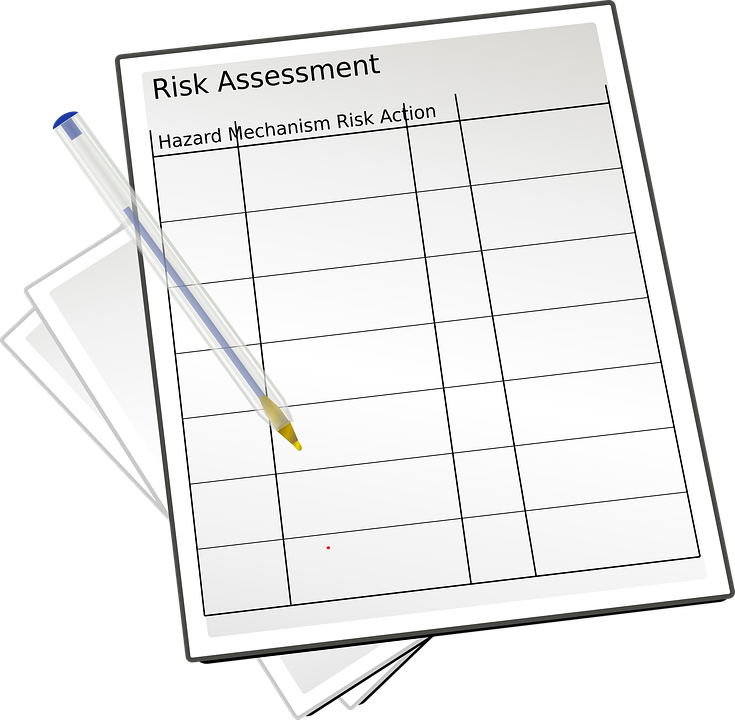 This will include additional and ancillary risks, and then analysing each one in terms of who could experience harm, the severity and probability of them happening, and what practical action can be taken in order to ideally eliminate or at least seriously reduce the risks. It’s always worth looking through these yourself, as a lot of things will be common-sense and real-life issues that you come across, but make sure you then have a suitable person to complete the final risk assessment, whether external help or internal expertise. Then finally log all this in a suitable risk assessment which is then regularly reviewed and updated. Here’s a basic and generic risk assessment that can help deal with this nice and easily.